The new OneKube™ with Dual USB Charger & Surge Protection brings your travel experience to a new standard. 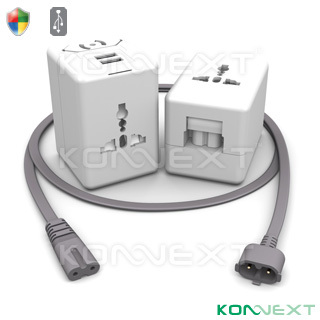 From the years of experience in research & development in travel power solutions, the OneKube™ combines the most unique features of our best selling items together with the newly developed SmartPlug™ Direct AC Slot. The OneKube™ equips with built-in dual USB charger, universal AC outlet, the new SmartPlug™ Direct AC Slot and the Surge Protection circuit will also provide protection to any harmful surge and spikes from your electronics. Combining all these features, the new OneKube™ with Dual USB Charger & Surge Protection is probably the most features packed and safest travel power solution in the world. ~ High Power Dual USB Charging Ports, charge 2 items at the same time!